The Waltz is in 3/4 time (3 beats to a measure) in phrases of two measures. Gentleman start with the left and the lady with the right - in time to the music - step left, bring your right foot next to your left and then step in place with your left. Then, starting with your right, do the same thing reversed (step-2-3, step-2-3). Do this until you are comfortable that you hear the beat and you are stepping on the beat. Also note that waltzes have a very strong first beat in each group of three (ONE-two-three). Be sure to start your three step pattern on that strong down beat. Further, waltz music is organized in pairs of threes - each waltz phrase is actually six beats. (ONE-two-three FOUR-five-six) It is best to start your first step on the first down beat in this six beat phrase. Now take a partner, and just try stepping in time to the music. Note that this is not THE Waltz step, but this is about getting your brain to assimilate the Waltz rhythm. Stand in the Victorian "Ballroom Position", with the man's right hand on the small of the lady's back and left hand out. The lady's right hand is in the gentleman's left (note, the hand hold is usually a little lower than the usual modern style) and the lady's left hand is at some comfortable place on his shoulder or forearm. The posture is erect but not stiff. You do not sway with the music. If you are wearing properly made Victorian garments (especially the ladies in their corsets) a proper upright Victorian posture will be your only viable option. Your bodies are not in contact, but you are also not at arm's length. Find a comfortable middle space. If the lady is in a hoop skirt, you will have to set the distance to comfortably accommodate it. A note particularly to the ladies: the grip of the hands should be VERY light. Do not squeeze your partner's hand. Further, your left hand should rest lightly on your partner's shoulder or forearm. Do not latch on there, or (if he is wearing a uniform), cling to his epaulets. If dancing fills you with terror, I have to tell you that what will happen will happen, and hanging on for dear life will not save you. However, it might cut off all circulation to important parts of your partner's body and make the likelihood of calamity even greater. A note to modern ballroom dancers: the "frame" has changed over time. 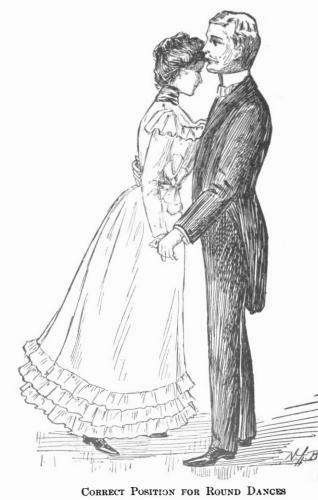 Since Victorian dancing rotates, and does not involve the man stepping towards the lady, the lady's left hand is not offering resistance but simply resting lightly (see the illustration above) or even hanging down to pull a ballgown out of the way. The Victorian frame, since the signals are less complex, is more relaxed and has less dynamic tension than the modern frame. The lady does not need early warning that you are lunging toward her or pulling away. The primary lead is with the man's right hand which rests in the small of the lady's back and secondarily with his left hand which is holding the lady's right. Novices usually pick this up fairly quickly but sometimes experienced modern ballroom dancers, who have strongly entrenched habits to unlearn, find it a bit disconcerting. The Victorian rotary Waltz consists of alternating between two distinctly different steps: the traveling step and the pivot step. When the man is traveling, the woman is pivoting; and when the man is pivoting, the woman is traveling. I am familiar with at least three historically documented, and yet different, ways of beginning the Waltz. I will describe the one demonstrated in the Library of Congress video below - as I feel that it is the easiest variation to learn and teach. It also has the advantage of being exactly the same step you will use through the whole dance. The dance is executed on the balls of your feet (not flat-footed). With your left foot, step out at about a 45 degree angle (to the side and slightly forward), then bring your right foot up and then step again with your left foot. In the process, you should end up the three step pattern facing the opposite of the direction you began (you start facing the outside of the circle and end facing the inside of the circle). This is often described as "My side, your side" as partners change sides around the dance. If you don't get half way around the circle with each triple step - don't fret. It is more important that you and your partner stay on the music and are both comfortable with the dance. With practice, it will come. The most common error on this step is that the man takes too long a stride. Not only does this make it difficult for a lady with shorter legs to keep up, but you might also find that long strides make it hard for you to follow the beat. When in doubt, start with small strides. Take a very small step back with your right foot so that it lands a little behind your left, and as the man travels around you, take two more small steps more or less in place (note: sometimes it works better to step a little forward). Precision of foot placement is not the key here. The key is adapting to his step to allow you to comfortably pivot while he moves around you. This could involve not stepping at all, but simply pivoting in place, but I would suggest, as a beginner, you keep your feet in motion. Note that you are not usually just marking time in place, but are performing a much smaller version of your partner's half circle. Adapt your step and your stride to your partner's. The end result is more important than the details. The second part of this pattern involves the lady executing the traveling step, starting with her left foot, while the man executes the pivot step, starting with his right foot. At the end of this six-step pattern, both partners are facing in their initial directions (men facing out, women facing in), having advanced a few feet around the circle and ready to begin the pattern again. Since your initial traveling step is longer than your follow on steps, you will tend to move around the room counterclockwise in "Line of Direction". Below is a video from the Library of Congress "American Memory" project that illustrates this most basic step. When watching, observe that a foot does not actually have to leave the ground to mark a beat, and that the dancers feet land in any number of different places depending on the geometry of the dance at that given instant. Given their height difference, the man is clearly shortening his stride. He also does not travel at all on his pivots, while on hers she clearly does -- all to accommodate the geometry of partners of differing statures. They key is, as always, keeping the beat and adapting to your partner.